It's often hard to know which of these messages links to what thread. My suggestion is this: Have the title of the thread in the subject of the message. 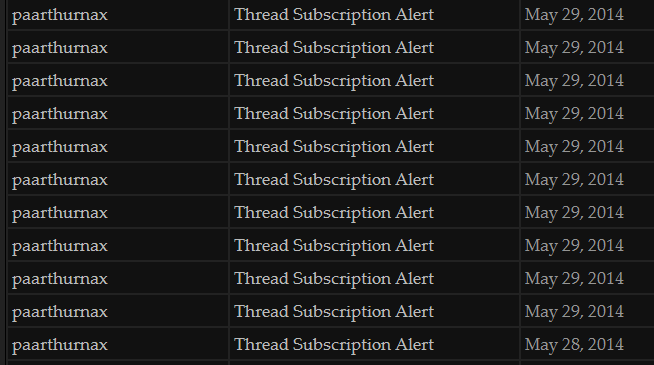 So instead of my inbox being filled with "Thread Subscription Alert" it's filled with "Thread Sub. Alert: (name of thread)"
I'm sure this wouldn't be difficult to implement and it would make navigating the inbox much easier. Nox fah tiidiil. Sure, this should be an easy change. Should be updated ... testing. It works! A fine addition, if I do say so.